Android P Beta 2 has been out now for a few days. The new beta, which is the third developer preview of Android P, brings refinements to the features introduced earlier and some new changes. One of those several changes is the addition of 157 new emoji. You can check these out on Emojipedia as part of Unicode 11.0. 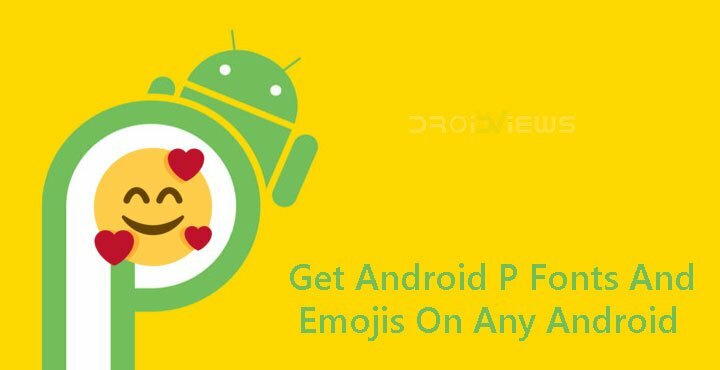 The Emojis are the latest Android P features to be made available to other Android devices. Earlier, we’ve had a port of the launcher, wind down mode, rotation suggestion, stock wallpapers, etc. We’ve also seen an Xposed module called Android P-ify which brings multiple Android P features to any Android. The Magisk module we’re concerned with today brings the fonts and emojis from Android P to any Android. Download the Android-P-Fonts-Emojis-v1.zip file using the link provided above. Transfer the file to your device if you’ve downloaded it using your PC or another device. Launch the Magisk Manager app on your phone and pull the side menu drawer with a swipe from the left edge of your screen. You can also just tap on the hamburger menu icon in the top-left to do this. Go to the Modules section and here you’ll find all of your installed modules if you have any. You can also add new modules from here. Just tap on the floating yellow + button at the bottom. Browse to the downloaded zip file (Android-P-Fonts-Emojis-v1.zip) and select it. The installation process will start and it shouldn’t take more than a few seconds. You can see how your screen would look in the screenshot below. Once the process is complete, you’ll see the options to CLOSE, SAVE LOG or REBOOT. Select REBOOT and once your device comes back on, you’ll find all the new emojis in the Google Keyboard or Gboard if you can spot them. Magisk modules do not make any changes to your device’s system partition. Thus, your device will be able to pass Google’s Safety Net checks and apps such as Netflix, banking apps, etc. will continue to work. However, you’re still dealing with making changes to the root partition of your device, something your device’s manufacturer does not want you to do. If you’ve already rooted your device with Magisk, you’ve most probably already lost the warranty. If you’re looking to root your device with Magisk, be warned that you will lose your warranty. My 6 pro getting very leg from update 10 stable. perform a full system wipe.